December 2, 2018 By Reuben Bolieu & filed under Against All Odds, All Articles, More…. 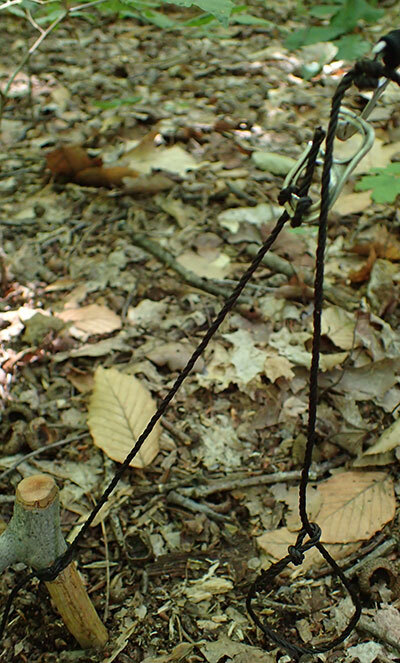 Twitch-up trap keeps tabs under tension while attached noose stays ready to snare an animal. It uses power of a bent sapling, held by the tabs and one wooden stake in the ground. No matter where we go in the wilderness, trash is strewn across the forest floor and in waterways: tin cans, plastic water bottles, clothing, foam, paper, and many other types of rubbish. Sadly, there is no place in the world immune to humans who litter or, as my old friend Ron Hood called them—the humis pigus! However, using a Swiss Army knife or multi-tool, most of this trash can be repurposed into some type of survival or wilderness comfort gear. A company worth looking at is Shomer-Tec. Their kit was the basis of my attempt to recreate what they made commercial—a food procurement kit. I used the all-too-common discarded beer and soda cans to make hooks and a twitch-up trap from the tabs. I used a Swiss Tool to cut the hooks to shape and attached both 550 paracord and bank line to them. Tin tabs were cut into hooks and a toggle for a trap. They can be used as fishing hooks or cut to simulate an L7 toggle for a twitch-up trap. I tied the bottom tab to a secured stake in the ground. The top tab was tied to a bent-over sapling with an additional noose tied to it. The two tabs were interlocked with tension, ready to be triggered when an animal came in contact with the noose, breaking apart the tabs and strangling the animal. Besides the obvious, a water bottle has many uses. On long boat rides on the Amazon River, I’ve seen water bottles cut in half to make two drinking cups, the top part looking like a martini glass. They can also be used for a waterproof safe for money, papers, and tinder. But if there’s no need for a canteen, I like to cut the top (mouth) off and use it in conjunction with a large, thick balloon as my water scooper for filling my water bladder in shallow waters. Author uses candle holder on his pole bed, held in place with a wooden stake pressed firmly in the ground. It offers candle light that is not going to get knocked over easily. By cutting two water bottles in half and fastening them together at the mouth (using duct tape or superglue), a candle holder can be made. It resembles an hourglass when standing. This type of candle holder can stand upright on the ground or be used to hand carry without the danger of burning the hand with hot wax. The wax will also stay collected in the bowl of the water bottle for reuse. With the amount of water bottles left in the wilderness or washed up on beaches, there is no reason not to make a few of these for a camp or even for emergency power outages at home. Fosters cook pot with wire hanger bail. Any soda or beer can is useable, but Fosters beer can is very rigid compared to others. Backpackers who like to go light and fast and to make their own gear have been utilizing the Fosters cook pot for years. The aluminum is thicker and wider than most regular beer/soda cans. 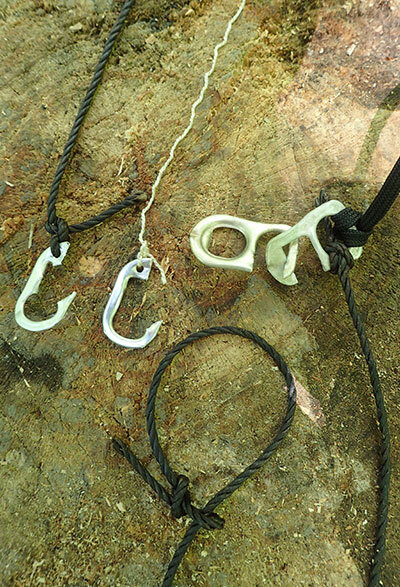 A hole punch can be used, along with a piece of wire coat hanger or snare wire, to attach a bail to hang the cook pot over a fire. The top should be cut off with a safety can opener to ensure there are no sharp edges and to keep the top as the pot lid. The small Super Cat or alcohol-style stove fits easily in the Fosters cook pot, and there’s room for a small water bottle filled with enough fuel (denatured alcohol) to last for a while. This makes a very simple and lightweight cook set. 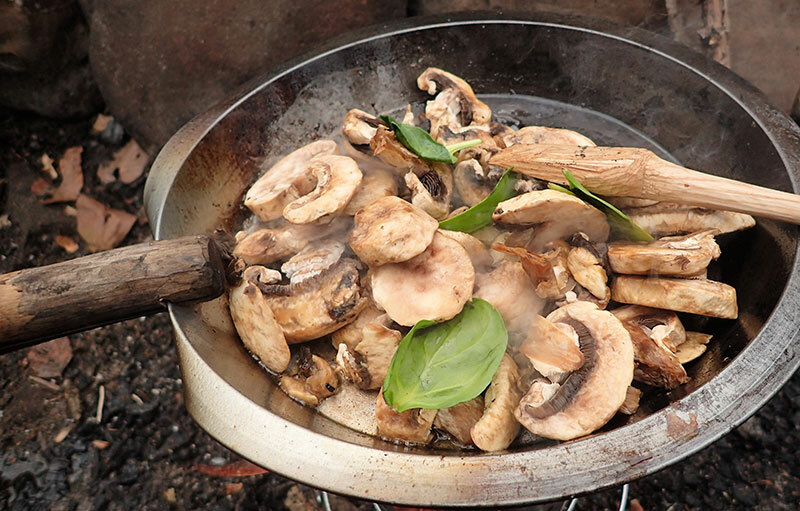 Use an old pie tin for a skillet that can be easily carried or cached in the woods. Stout piece of wood makes a good handle when a notch is cut into it. Another example of hobo cooking is the use of a heavy pie tin for baking, over the lighter, flimsy pie tins found on commercially baked goods. These make good skillets for outdoor cooking and they last a long time, especially when kept outdoors. Simply bend one section of the edge down with your fingers in a pinching motion. This creates a lip for the handle to attach. To make the handle, select the end of the piece of wood that will be closer to the food and clean it up with some light carving to get rid of any bacteria. 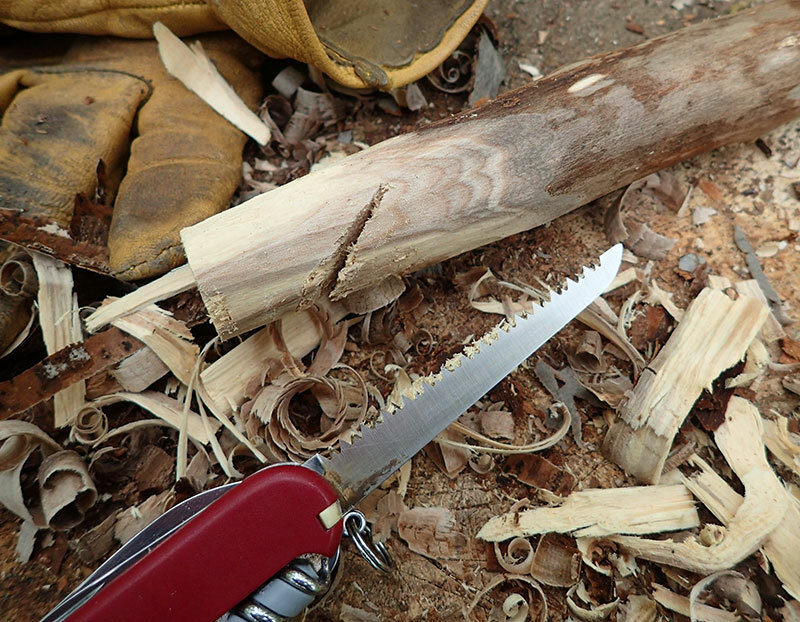 Use a saw to cut a diagonal notch about 2/3 through the wood. Green wood is good to use because it is stronger and more fire resistant than dry wood when over hot coals or low flame. Cutting diagonal notch in a stout stick allows it to attach onto the edge of the tin as a handle. The handle can be as long as needed, and the thickness about the size of a broomstick or a little thicker. I found that the thickness of a Swiss Army knife saw makes a cut that has the right width to fit onto the lip of the tin. Fit the handle and play with it until it feels secure enough to trust with your grub! 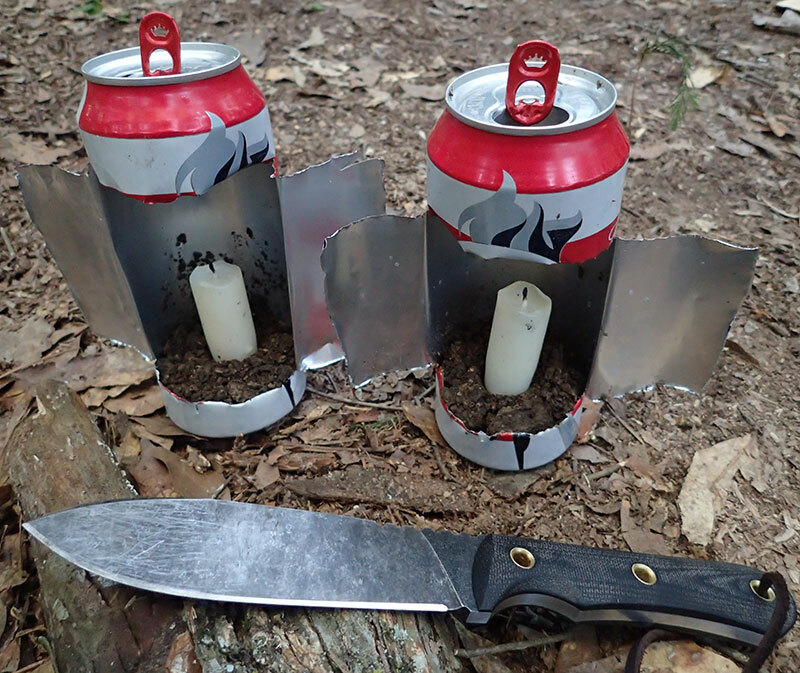 Two discarded beer cans were made into camp lanterns by cutting H shape into the cans and opening them up. Wings can be adjusted to act as wind covers. 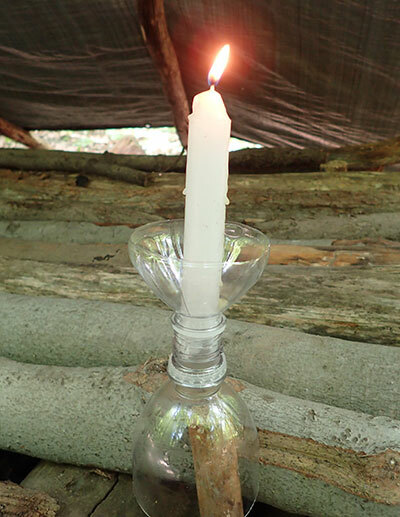 Another use for cans found in the wilderness or washed up on shore is for maximizing light with a candle. A sharp knife is all you need for making a large capital “H” shape in the can. Once the cut is made, bend open the flaps so they look like wings and fill the bottom section with dirt, mud, or sand. Stick the candle in the soil so it stands upright to help balance it. The tab at the top can be used to hang the lantern up high. The flaps help keep the wind at the back of the lantern if it’s facing the correct way. A quick tip for the most secure way to hold the candle inside is with a scrap nail found in an old post or scrap piece of wood. Poke it through the bottom so the candle can be stuck onto it for a secure, safe way to keep your light upright. The next time you’re in the woods, beach, desert, or taking a canoe or kayak out, observe the amount of garbage present. Pick some up and try to make something. 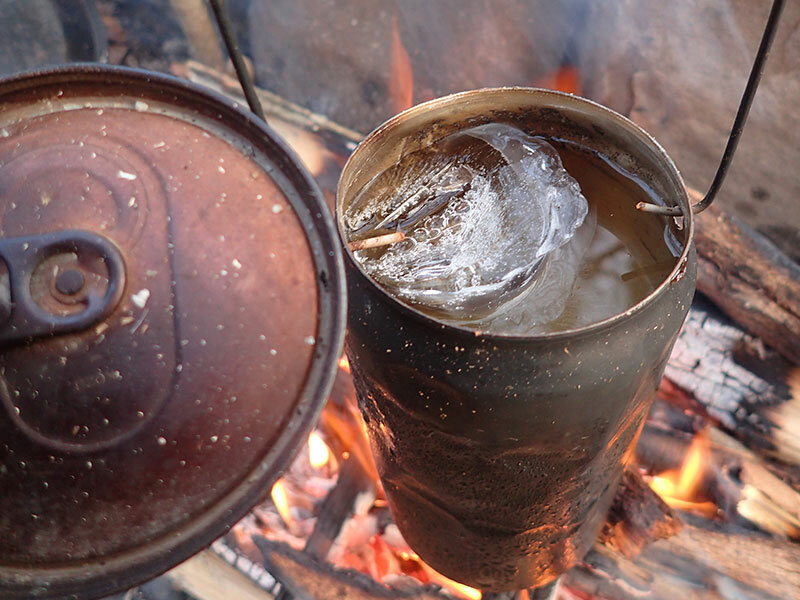 You’ll be surprised at what a little ingenuity and creativity can do for you in a survival situation.